This Twin-Screw 35’ 6” Liverpool Class lifeboat (originally named B.H.M.H.) was built in 1951 by Rowhedge Ironworks as ON882 and was part of the RNLI operational fleet until 1984. 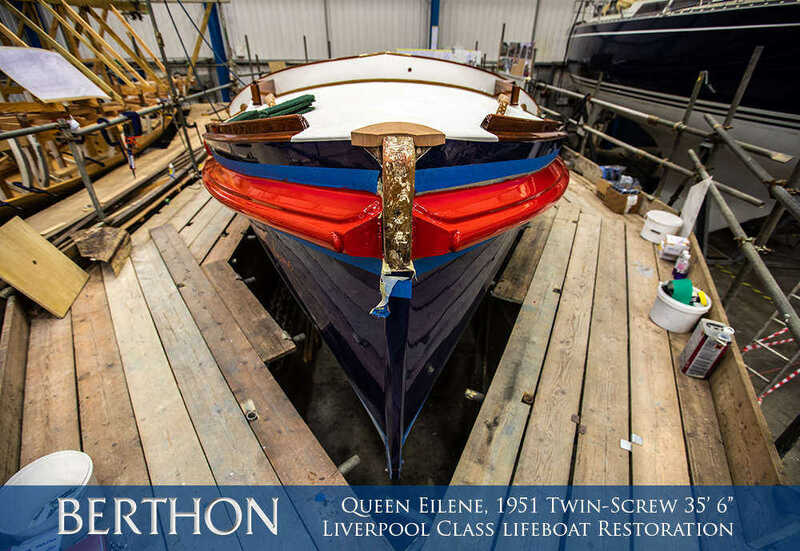 30 years of RNLI service and a further 30 years in private ownership had taken a serious toll on her; having arrived at Berthon in mid-2018, she is here for a complete restoration and reengineering. Cosmetically, this includes stripping her from stem to stern, sanded, varnished and repainted in her original colours with the bronze work brought back to the original condition. 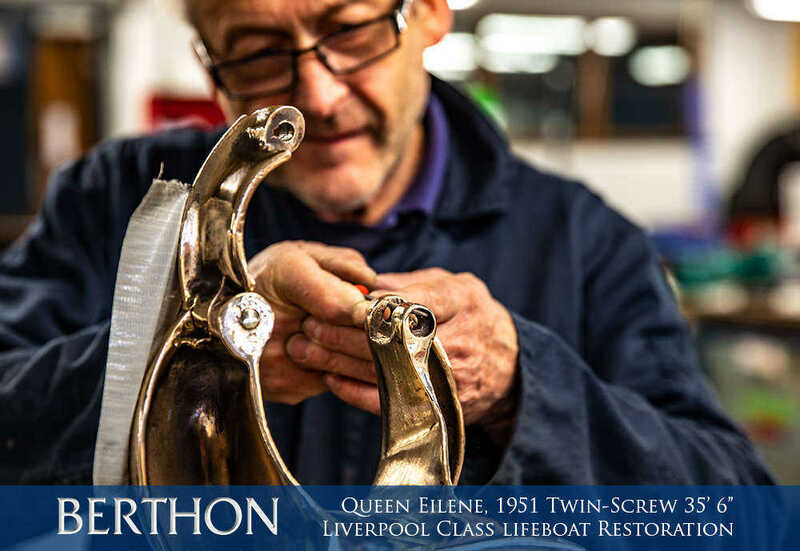 However, Queen Eilene has also undergone some fairly major structural repairs, installation of two new engines coupled to hydraulic drive motors and a pair of hydraulic side thrusters whilst in the Berthon sheds. 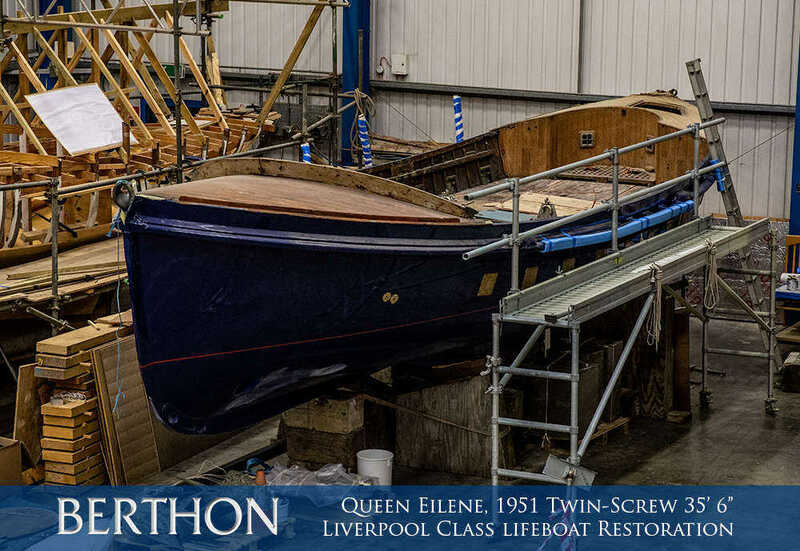 With new raw water systems, exhaust systems, electrical systems and a vast amount of painting and varnishing we expect Queen Eilene to be back on the water in resplendent fashion during 2019. The Liverool class was based on the 35’6” (10.82m) Self-righting motor class from 1929, but had a greater beam (10 ft (3.0 m) rather than 8’10” (2.69 m) and much shallower endboxes. The shelter (not shown in these images as it has been removed during the restoration) was extended forward to cover the engine compartment, which was watertight and allowed the engines to continue to operate as long as the air intake was not submerged. We will bring you more on her and her refit in the coming months, with a full write up on the work that was carried out along with her history and some quite incredible historic photos.